No, it's not the latest game from Zynga. Produce-picking robots are just on the horizon, and will save time, labor, money—and maybe even food. Robots have come a long way—there are robots that make noodles, and drones are being used to investigate farming practices. 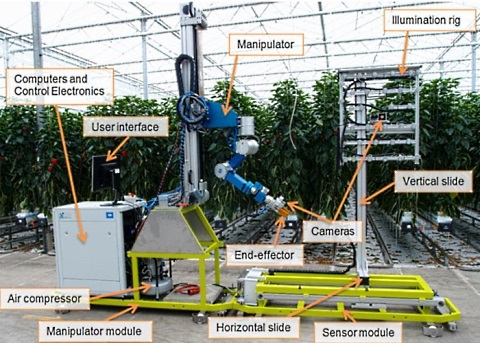 Now there is the WP5 robotic pepper picker, which employs computer vision and other advanced technologies to autonomously pick ripe fruit, reports Singularity Hub. Thanks to a combination of cheap sensors and computer vision, robots are able to autonomously perform complex farming tasks including plowing, plant and soil surveillance, and even the harvesting of fruit and vegetables. Today, agricultural workers make up just over 2% of the workforce—but is the outright automation of farming on the horizon? Picking fruits and vegetables is hard work, and immigration issues aside, it’s often backbreaking and thankless for the people who do it. However, like so many other farming and growing chores, it’s necessary if you want to enjoy fresh fruits and vegetables. Although robots have long since become common fixtures in manufacturing industries, there were far too many variables to consider when harvesting fruits and veggies—until now. The WP5 has a long way to go before it’s a viable option, though. Picking time is still too long, and the cost of each robotic setup needs to be in line, as well. Researchers estimate that a sub-six-second pick time combined with pricing at or under €195,000 ($264,599) for a single robot that will hold up for at least five years is what will make this technology a viable option. Advanced robots are already making cow milking a breeze for smaller dairy farmers—as well as their cows. The New York Times reports that cows being milked robotically actually seem to be more relaxed than when humans were performing the chore. The cows also get a greater degree of autonomy, since they essentially milk themselves whenever they want. We’re unsure how we feel about the complete automation of farming. Job displacement is always a concern when talking about robots, and at this point, we’re conditioned to worry about the inevitable robot uprising. That being said, we believe humans, machines, and robots can all work hand in hand.